Sessions are currently held on a Tuesday between 6-7pm. We meet at Craven Leisure. In summer we meet at Sandylands but parents will be advised when this is the case. There’s no obligation to join immediately, just come along and try out for a few weeks, then if you like what we offer sign up and become a member of Skipton AC and represent your club with pride! As we build up a junior membership we will be looking at entering some races. Having a race or a series of races to look forward to gives a focus in training and provides an opportunity to run against juniors from other clubs of similar ages and ability. 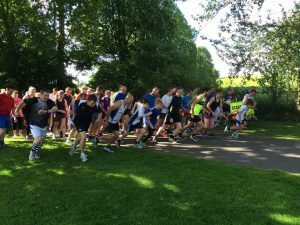 As a primary focus there is parkrun which, is a series of 5k runs held on Saturday mornings in areas of open space around the UK. They are open to all and free and easy to take part in. The local parkrun is at Aireville Park, Skipton. The run starts at 9am. Check out their website for further information www.parkrun.org.uk. For more details contact skiptonacjuniors@gmail.com if you have any questions about junior running.